The holiday season is the perfect time to deck your halls with festive colors, and you'll really get into the spirit with these roses, dyed in every color of the rainbow. The roses can be dyed in any combination of colors to match the occasion, and they are perfect for centerpieces, bouquets or gifts. You can even add glitter to them to make the holidays really sparkle. 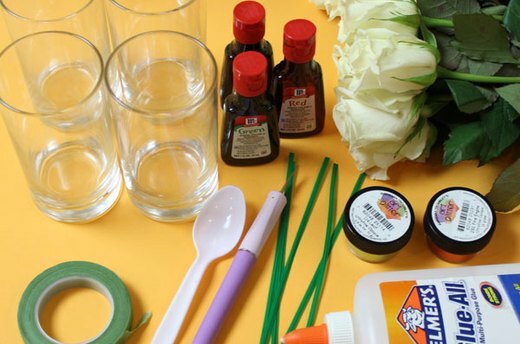 To make rainbow roses, you'll need white roses, a craft knife, food coloring, glass tumblers (or plastic cups), twist ties, a plastic spoon, floral tape, glitter and glue. 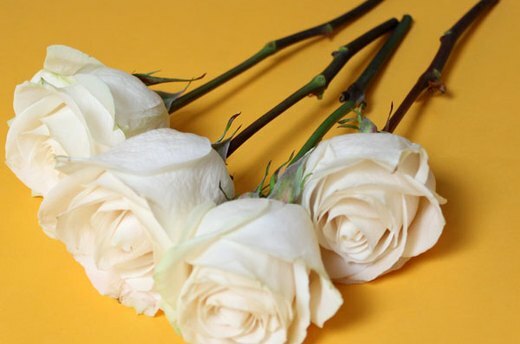 Start with white roses, as they dye better than roses that already have color. Cut the roses, leaving about nine inches of stem. Also remove all the leaves from the stems. Fill four glasses with water. In each glass, add drops of different food coloring, stirring with a plastic spoon. Add food coloring until the water is practically opaque. Blue and green dyes turn the water opaque very quickly, while it takes a little more for red and yellow dyes. Using a craft knife, carefully cut down the middle of the stem, making an incision of about four to five inches. It helps to cut on a cutting mat to protect your work surface. Watch your fingers! 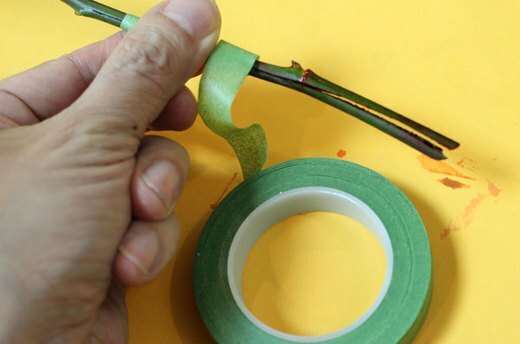 Use the knife again to divide the stem halves so you have four stem sections. However, if your rose has a skinny stem, you will not be able to cut it into quarters. Just leave it with two halves. 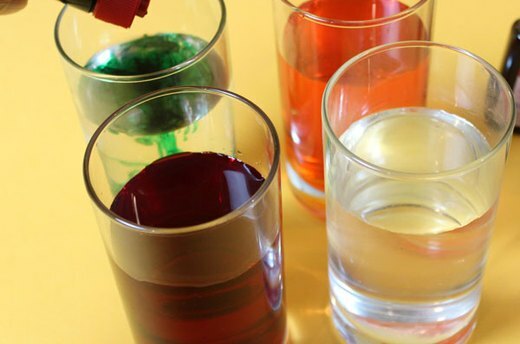 Place the stem sections into the different glasses of food coloring. 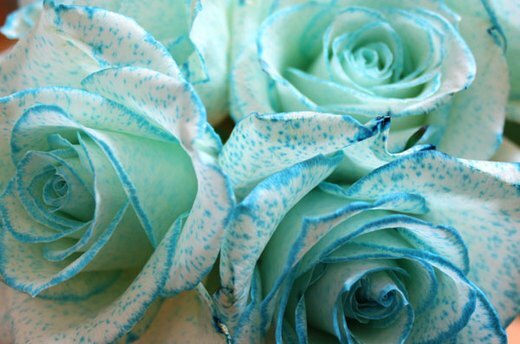 You can dye multiple roses at a time by tying them together with a twist tie to keep the roses standing up straight. 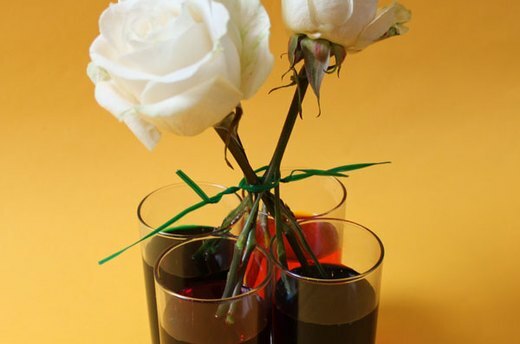 For your roses with skinny stems cut into halves, place the stems in two colors rather than four. Two colors are actually ideal for most holidays, e.g., red and green for Christmas. Let the rose stems sit in the food coloring for at least 24 hours, and ideally 48 hours. 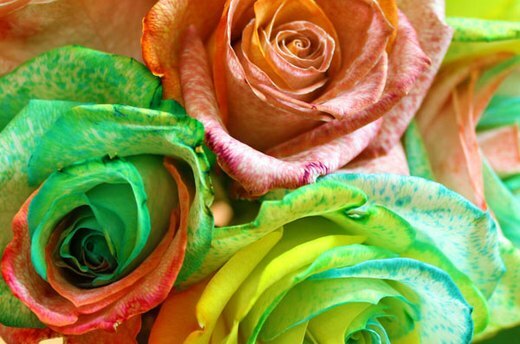 You will see that colors interact differently with the roses. Some colors become completely absorbed in the petals, while others only tint the tips of the petals. Part of the fun of this project is experimenting. 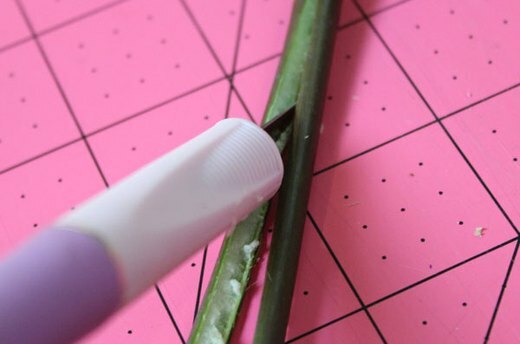 Use floral tape, available at most crafts stores, to tape the stem sections back together. The rainbow roses already look beautiful, but to make them really sparkle for the holidays, embellish them with glitter. In a plastic cup, mix one part white glue with four parts water so that the glue mixture has the consistency of milk. Then dip the tips of each rose in the glue. Blot the rose on a paper towel to remove excess glue. Pour some glitter on a paper plate. Dip the rose in the glitter, turning the rose to cover all the edges. 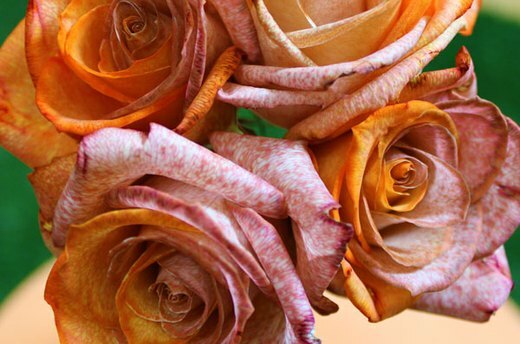 These autumn-hued roses, dyed with orange and purple food coloring, are perfect for a Thanksgiving arrangement. The orange was created by combining red and yellow, and the purple was created by combining red and blue. 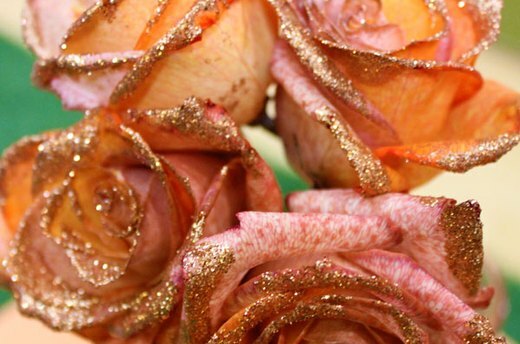 With the addition of some gold glitter, these roses are a feast for the eyes. These Christmas blooms were created by soaking rose stem halves in red and green food coloring. They look like Christmas candy. 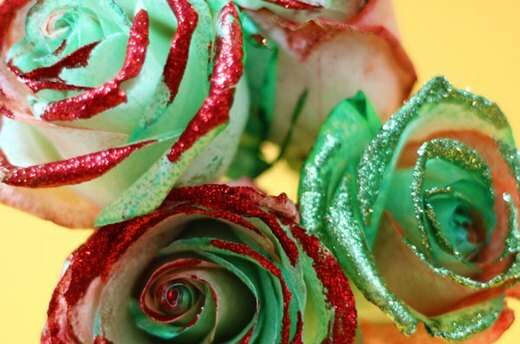 With a little red and green glitter, these roses are even more festive. 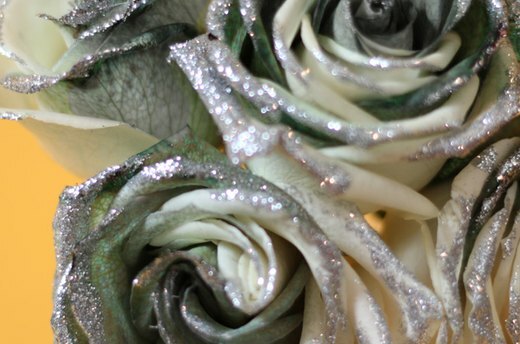 Notice how well the color of the glitter complements the color of the roses. From experience, I learned that blue food coloring does not saturate the petals, so for these blue and white Hanukkah roses, I just inserted the entire stem in blue food coloring, knowing that much of the petals would remain white. 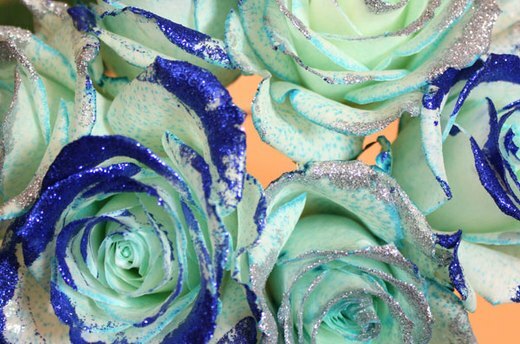 Adding silver and blue glitter to the roses makes these flowers perfect for a Hanukkah celebration. These black and white tuxedo roses were created by placing one half of the stem in black food coloring, and the other half in regular water. 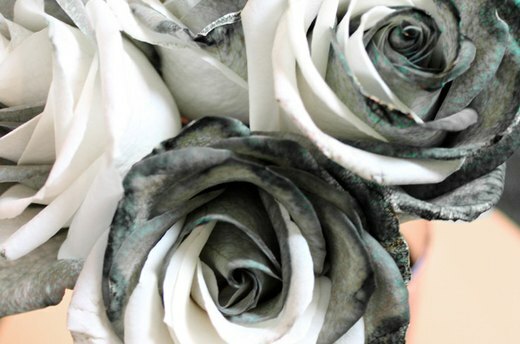 Dip the black and white roses in silver glitter, and you'll be ringing in the new year with style.